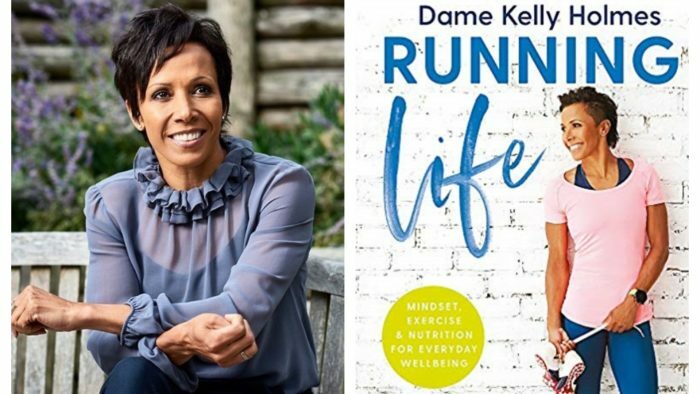 To anyone who has ever been a runner, watched the Olympics, followed sport or is a social media user – Colonel Dame Kelly Holmes MBE (mil) should need no introduction. However…..
We could list her major medal achievements (two Olympic Gold medals at Athens 2004; one Olympic Bronze in Sydney 2000; two IAAF World Championship Silvers and one Bronze; two Commonwealth Gold and one Silver medals; European Championship and World Indoor medals to name but a few); we could mention her being named BBC Sports Personality of the Year in 2004; we could recall how 60,000 people turned out in her home town for a parade after her double Olympic Gold medal achievements; we may mention her charitable trust (The Dame Kelly Holmes Trust) that she set up 10 years ago after her retirement from athletics that helps young people who face disadvantage; maybe we’d think about how she was one of seven British Olympic legends who were selected to be part of the London 2012 opening ceremony to help young athletes light the flame; we can recall her work on publicising mental health issues to help remove the stigma that many people face; and maybe for those that visited her café in her home town of Hildenborough they will remember her serving coffee or cleaning the tables. Last year Kelly was appointed Honorary Colonel of the Royal Armoured Corps, marking her return to the army. With a cv like that, you would be hard pressed to wonder just how someone could top all those achievements and accolades. I’ll tell you how. It’s when you hear people talk about her, they just talk about Kelly. No surname required. 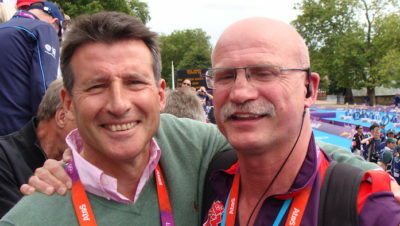 “Did you see Kelly came to our parkrun last week? Couldn’t keep up with her but I met her and got a picture afterwards”, or “went to Kelly’s café last month – loved the food and seeing her was a massive bonus”, or “you should check out her social media feeds with her workouts – it made me do extra reps at the gym”, or “we love her. So friendly, accessible and when she talks you can’t help but admire her openness and honesty”. You can read Kelly’s new book, Running Life, now available from Amazon; or follow her on social media (Instagram and Twitter). We are therefore VERY pleased to feature Kelly and her marathon memories from London in 2016 as part of our ‘My First Marathon’ series. 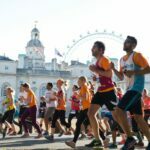 We don’t really need to ask this but what sort of running did you do before your first marathon and how long had you been running? I’ve been running since I was at secondary school. My PE teacher, who I am still friends with now, was the one who encouraged me to take up running. I’m primarily a middle distance runner. 24th April 2016 in London, I had done ONE half marathon before. I also felt ready for a new personal challenge. I started my training in January as soon as I had committed to run the marathon. I downloaded a programme to have some guidance on how to up the distance, but that was it. No but I spoke to the legend Paula Radcliffe and she just said I needed to make sure I got the mileage in. I did a lot of it on my own but as the mileage increased at the weekends I got someone to cycle with me. I’m a middle distance runner so I had to learn how to pace myself for the longer distance. I also needed to look after my body more with the long distance and started yoga classes. Not at mantra as such but I focused on my music and thought about chocolate. I stretched after and also did a lot of Epsom salt baths. I warmed up as part of the run which isn’t always good. Yes, I had quite a few neural problems and ended up having anti inflammatory injections in my glutes and lower back to relieve the tension. I was doing quite a bit of PR so it was in my mind all the time although I had cut right back on my training so it was a nice recovery week. I was hoping to get round in 3hours 30min. The crowds and the atmosphere were amazing. Everyone was so supportive of each other. I did wear headphones but they were bone conductors so I could hear both music and the crowds. I didn’t have a lucky charm but I always have a strict pre-race superstition and have to lay my kit out the night before. Every single item has to be laid out. Not as bad as I thought because I stuck to the plan for the first half of the run which really helped me. 3 hours and 11 minutes which I was VERY happy with. It was definitely Never Again at the time. If “never again” how long did it take to change your mind? I haven’t just yet but never say never as they say! Unless it involves water! It was all good. I was nervous as I didn’t want to get injured but as a whole it was great. Just a bloody long way! I decided that instead of doing the pasta carb loading I would stick to what I know best! So I had a big rice dish two nights before. The day before I grazed ALL day on nuts, yogurts, rice cakes, cheese, crackers and it really fuelled me up for the actual day. I don’t eat pasta really so it would not have been good to suddenly bring that in. Having the race in my head now would just prepare me mentally for another long challenge. No only Ride London 46, twice. If you haven’t done a marathon since, do you think you ever will? 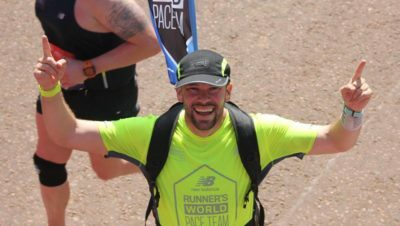 I love parkrun as they are so inclusive and I often take part in my local parkrun in Tonbridge but I enjoy being a tourist, which means doing different park runs at different locations. I enjoy doing parkruns and meeting new people. I have taken part in a couple in South Africa in the Summer which is always amazing. 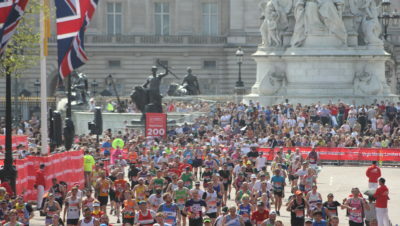 What four pieces of advice would you give to some thinking about doing a marathon?